A lot of my stuff has been published there. A full listing of recent items including articles by other authors can be found at the Labour Affairs website. Issues more than a year old are available on-line: see below for links. To subscribe or to purchase a single issue, go to the Athol Books webpage. 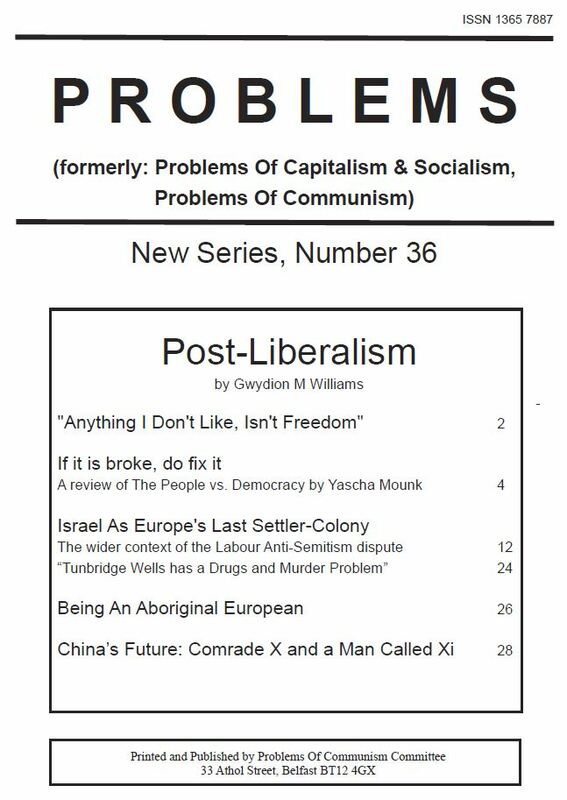 Problems 37 – The End of the Road for New Right Ideas. Speak of ‘Our Freedoms’ rather than ‘The Freedom’. How ‘Liberalism’ has been a name for many different things, some way outside of acceptable modern ideas. Why Israel since the Six Day War has been breaking Western norms. And got worse from the 1990s. And why Xi’s China is an excellent prospect for the future. If we stand on the shoulders of cannibal giants, it is embarrassing. An inconvenient truth that we need to face up to. We must also ask if there a better way? Except for those way out of tune with modern life, the answer would mostly be ‘no’. Arthur Balfour was a late-blooming version of the original Enlightened Aristocrats. He’d have made a good Enlightened Autocrat, had the times been suitable. As things were, he was called ‘Bloody Balfour’ for his repression of Irish Nationalism. Much less well-known is his successful curing of the Irish Land Question by buying out the landlords. Magazines more than a year old are posted online. Even that was not history. Troy was a small place. Its main decline was due to an earthquake. Its people were weak ruin-dwellers when it was later sacked. The Tsarist state had broken down. A landlord restoration was being prepared regardless of what Lenin had done. This was the first in a ten-part series. The link takes you to the first three, and on to the others. These are on the Labour Affairs website. How it failed overall, but allowed the rich to gain a lot more than their fair share. How the Soviet Union made vast economic gains under Stalin. And was doing OK up until the 1970s. Also available as a PDF, Problems 31 – Feed-the-Rich Economics. How the British Ruling Class viewed Hitler as both useful and threatening: but more useful up until his annexation of what’s now the Czech Republic. Problems 28: Asocialism: Part One; The Muon and the Green Great Dragon. Why atoms are not really ‘a hole in a hole’. Why any native English speaker would know that a ‘green great dragon’ was bad English, but would be unlikely to know why. How the question ‘why’ is very different for human matters and for the physical universe. How religions came in waves of ideas, and gave us ways to organise our thinking that had not existed before. The cowboy scholarship of ‘Wild Swan’ Chang and ‘Doc’ Halliday. Why a very civilised Frenchmen called the Chinese ‘Blue Ants’. How ‘Old China Hands’ in 1950 thought that the new Communist government would be as ineffective as the Kuomintang had been. The amazing ignorance about ‘Red China’ found in 1950s USA. Blood, Opium and Gunboats: how the West had messed up China before 1949. The Amethyst Incident: when Gunboat Diplomacy ended. Also available as a PDF, Problems 25 China’s ‘Blue Ants’. The West’s false understanding of ‘Normal Politics’. How the Kuomintang failed to develop anything much during their period of rule. How they failed to confront Global Imperialism, and then were very slow to resist Japan’s expansion into Chinese territory. An interesting account of the first years after 1949, by a Christian missionary who stayed in China when most Westerners left or were expelled. How Edgar Snow was well aware of the crisis after the Great Leap Forward, but noted the unusual weather and did not class it as a famine. Why it become the job of the Chinese Communist Party to complete the necessary nationalist revolution that the Kuomintang had backed away from in 1927. The unexpected role of Madam Sun (Soong Ching-ling) in publicising and strengthening Mao Zedong via Edgar Snow’s Red Star Over China. Problems 22 – China’s Blue Republic, 1912-49. Stalin: Paradoxes of Power. China’s ‘Blue Republic’ lasted from 1912 to 1949, and achieved nothing. It achieved nothing because it was trying to erect a copy of the complex political structures of the USA or Western Europe on top of a society that had very different value. And doing it with a false understanding of the intricate political processes that had occurred there. Stalin shaped the Soviet Union, which was for a long time regarded as the first and most important example of a working model of socialism. Problems 21 – China: Why a sophistocated Empire could not modernise. Including details of the exceptional nature of European developments. And how Japan managed to modernise without uprooting its traditional culture. Also available as a PDF, Problems 21 – Imperial China. Why The Ming Sea Voyages Led To Nothing. Chinese vessels reached East Africa a few decades before Columbus and Vasco de Gama. The Chinese ships were much better than anything Europe had until much later. But the whole enterprise was abandoned, which is an historic enigma. Petty on English State Capitalism. Writing a much more authentic description than the later work of Adam Smith. How he anticipated the modern world much better than Smith did, including the possibility of Britain becoming a country mostly devoted to industry and commerce, with agriculture margainalised. And was in favour of tax as part of the developing economy, accepting the necessary role of the state. The Diverse Forms of Democracy – much wider than the Western system. Orwell on Spain and Britain. George Orwell was part of Britain’s 20th century mistake. His vision of socialism would have been an improved British Empire using socialist ideology. He never read much history or economics. He was frequently wrong and sometimes dishonest. Why the Left lost the Spanish Civil War. Mostly concerned with the popular view that credits George Orwell and POUM and downplays the achievement of the Communist Movement. British and US Genocide. The standard Anglo view of the two World Wars was used to justify the Second Gulf War. It wasn’t true. Fascism and Hitler flourished for many years with the encouragement of Britain’s National Government. Including details of how mainstream Science Fiction before World War Two was sometime positive or neutral about genocide.